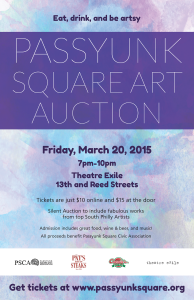 THANK YOU to everyone who supported the 5th Annual Passyunk Square Art Auction! Sponsors, donors and especially our amazing artists–we could not do it without you! Art lovers, mark your calendars! 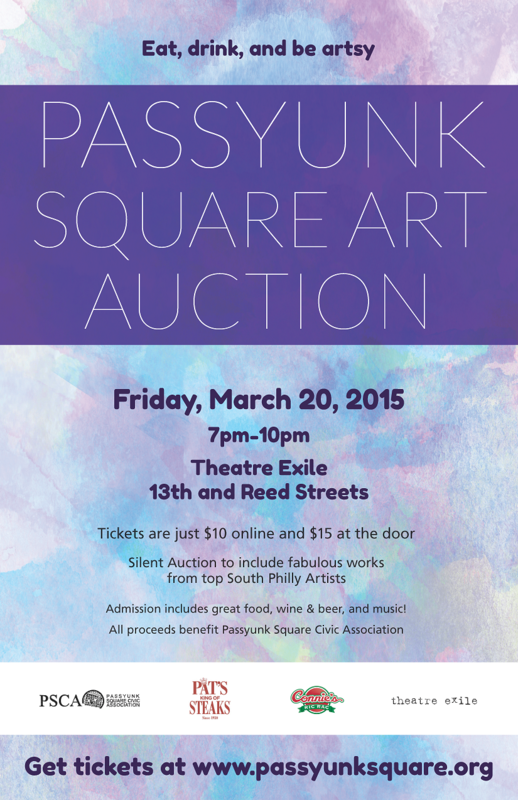 On Friday, April 1, 2016, from 7–10 p.m., the Passyunk Square Civic Association will host the 5th Annual Passyunk Square Art Auction! 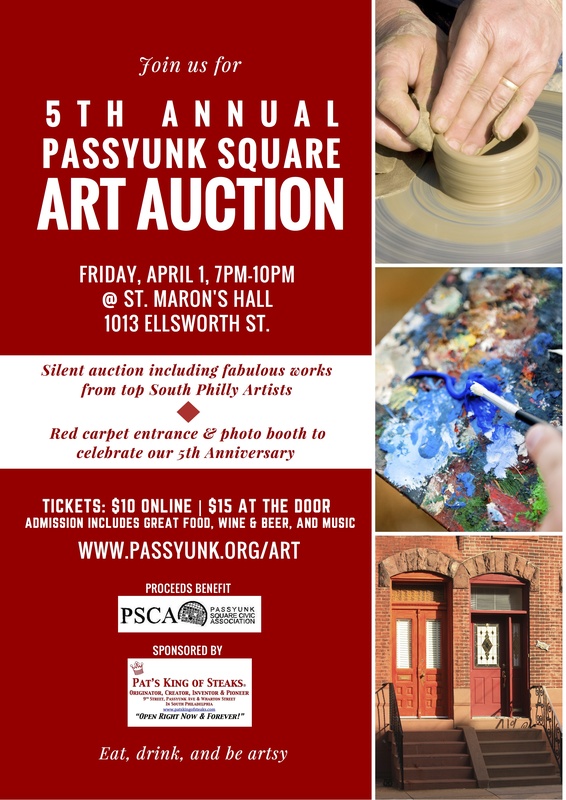 The auction, which will be held at St. Maron’s Hall at 1013 Ellsworth St., will feature sculpture, prints, jewelry, photography and paintings from more than 30 incredible South Philly artists! Complimentary food and drink from local establishments will be included for all attendees to add to the festivities. In addition to the auction where you will be able to place bids on the art, there will be items for sale from the artists and a raffle! Tickets for the event can be purchased for $10 online (+ $1.50 processing fee) or at the door the day of the event for $15, and proceeds will benefit the Passyunk Square Civic Association. Since we will be celebrating the 5th anniversary of the auction, you are welcome to get a little fancy! We’re talking boas, top hats, monocles … AND there will be a red carpet entrance and photo booth to add to the fun! Buy your tickets here: online ticket sales have ended. From the Newsletter: Art Auction Tickets Available Now! TICKETS NOW ON SALE FOR THE UPCOMING 4TH ANNUAL ART AUCTION AT THEATRE EXILE! We have nearly 30 South Philly artists participating with an incredible range of work. Please come out for an evening of culture and take home a beautiful new piece of art. The event will feature live music, great food from local restaurants, beer and wine. Buy your ticket in advance here and save $5! We look forward to seeing you there on Friday, March 20 from 7 to 10 pm at Theatre Exile! More information is available at passyunksquare.org/art. 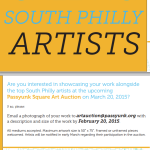 Are you a South Philly artist interested in showcasing your work alongside other top South Philly artists at the upcoming Passyunk Square Art Auction on March 20, 2015? 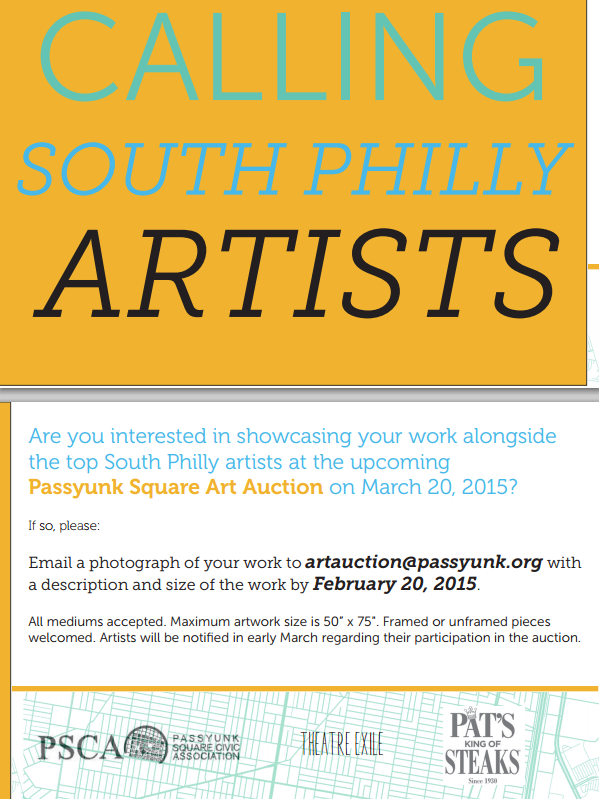 If so please email a photograph of your work to artauction@passyunk.org with a description and size of your work by February 20, 2015. All mediums accepted. Maximum artwork size is 50″ x 75″. Framed or unframed pieces welcomed. Artists will be notified in early March regarding their participation in the auction.